Polish Pottery Stoneware plates - Ceramic dinnerware plates handmade in Boleslawiec. Home > PLATES & PLATTERS > Bread Plates / Dessert Plates 7.6"
Home > SERVING PIECES > Bread Plates / Dessert Plates 7.6"
Hand Painted Dessert Plates. 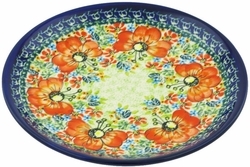 This versatile Polish Pottery bread/dessert plate is ideal for serving a variety of dishes. This longtime favorite is made of durable stoneware, festive enough for entertaining as well as everyday use.